Permanganate’s oxidation chemistry is unique in its capability to rapidly eliminate obnoxious and dangerous odor compounds, whether in air or water. It has been used to control odors from a variety of industries from food processing and manufacturing plants. Today, there is much interest in controlling odors released during the collection, handling, and disposal of landfill leachate. While the primary focus of leachate treatment must always be to meet the applicable environmental regulations, fugitive odors cannot be ignored. Permanganate treatment is used to rapidly eliminate the reduced sulfur and nitrogen compounds commonly found in non-hazardous landfill leachate. Permanganate chemistry is easy to implement and use with the availability of concentrated liquid permanganate products such as CARUSOL® liquid permanganate. This presentation will discuss the basic chemistry of the permanganate treatment and its practical implementation at actual landfill sites. Mr. John Boll is currently the Global Technical Program Manager for Carus Corporation. John has been with Carus Corporation for over 40 years, serving in a variety of sales and marketing positions. The technical service department provides chemistry and applications customer support, including on-site lab testing and plant-scale start-up and troubleshooting services. John earned his B.A in engineering from Purdue University, West Lafayette, IN. He is a member of the Water Environment Federation (WEF) and the American Water Works Association (AWWA) where he served as the AWWA, Illinois Section Chair from 1992 to 1993. Are you interested in reaching potential customers directly through putting on an informative and dynamic session? 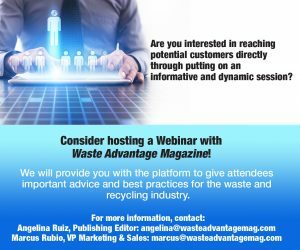 Consider hosting a Webinar with Waste Advantage Magazine! We will provide you with the platform to give attendees important advice and best practices for the waste and recycling industry. Use the form below to contact us about hosting your webinar today!